Got an online quote from SGI. Phoned Westland Insurance in Calgary who told me SGI did not offer monthly payment plan. Phoned SGI and they said yes, they do and that I should have been given the plan. Stay far far away from Westland Insurance brokers, and stay even further away from SGI Canada. I was insured through a broker with SGI a few years back and blew the engine in my truck leaving me with my other vehicle to drive. I faxed them and cancelled my insurance on the truck because I couldn't drive it. Westland refused to rebate me for 9 months of insurance for the cancellation. I got a hold of SGI and was finally paid my rebate after 10 months from the time of the cancellation. SGI is the worst insurance company I have ever dealt with. Please for your sake stay away from them. Worst company I ever dealt with in my life. I had 3 vehicles insured. In July, I asked to have one removed. August came, still not removed, September came, still not removed. Broker started ignoring my emails. Had to finally call a manager to get it taken care of. Got an email stating my new payment would be $235, coming out of my acc on Oct 5th, then a letter in the mail a week later saying $144 would come out Oct 21st. Assuming they refunded me for their mistake of not removing the vehicle since July. Payment tried to come out Oct 5th from an account I no longer use, so it went back NSF. Had no clue til following week, I got a cancellation letter. Called and lost my temper on them, asked for a manager. Conveniently, they're all in a meeting!!! Not willing to own up to their own mistakes, so I ended up having to pay off my policy in full and they will no longer do monthly payment at all because they screwed up sending me wrong information. None of this would have happened if they would have removed the vehicle in July like they were supposed to. Bunch of crooks. Needless to say, once my policy is done in 2 months, I'll be done with their crap!!! Received an auto insurance quote for just over $200 a month and was accepted by both parties. Received the temporary permit through email. After 5 days, the rates went to over $800 a month. SGI stated it had an MTO (Ministry Transport Ontario) report of an accident. SGI would not provide a copy of the MTO report after multiple requests, so we went to the police and found out that there was no MTO report. We then tried to cancel the policy, which SGI denied, as SGI then said that there was a conflict with the non-existent report and their policies, so SGI cancelled the policy. This all took place within 4 weeks. SGI still continued to take the $800 a month, on top of the original $200 initial for the policy, yes, that was over $1000 for 4 weeks of insurance! We have yet to receive anything in the mail about the policy. SGI now refuse to contact us, and no longer answer any text, emails or phone calls. I was hit by a deer. I was denied for coverage even though I got an active Auto Pak on top of my regular auto insurance to cover any wild wide collision and rental car coverage. The out-of-province adjuster avoided me and refused to phone me back for any updates. I was told to have any car fixed at my own expense. Beware for out-of-province trips. If you have ever had your vehicle impounded and you could not afford to pick it up and they said it went to auction as a salvage with no keys which was a total lie, we need to talk. My vehicle didn't even make it to the auction and sold to the towing company for 350.00. The vehicle, if at the auction, would have sold for between 4 and 5000.00. But now I have to pay 1226.00 before I get my drivers licence back and the towing company has my car and is trying to sell it for 1500.00. Complete fraud. I got into a hit&run accident on a highway, the company tried to blame me for the case! After I got into an accident especially when I'm not at fault, I was waiting for SGI adjuster to help me, but instead, she tried everything to question me like I'm the one hit&ran away. Doesn't matter if my car is covered or not, this is a useless insurance, whoever buys their insurance one day you're gonna get deceived by them. I talked to one of their customer service representatives and honestly, the experience was absolutely terrible. They were so judgemental and one even laughed at me while I was making my claim. I am sorry, but when someone is in distress and talking about an accident, that is not the way to speak to them. And the person I spoke to acted like she knew exactly what happened and wouldn't even listen to me. And when I requested to draw a diagram for them they refused my request because they said that I was lying. If they weren't a requirement by the government, they would have no customers because they are the worst insurance company in existence. Always denied claims that were legit. They took the word of a car theif over Me. A paying customer...i ain't a theif. And totally lost that car. No returned calls, fluctuating premiums and a double bank withdrawal. My policy was switched to SGI by their parent company and I was informed that my rates would be lower due to my clean driving record. I was initially told, after calling to inquire what my premium was, that they were backlogged due to changes within their office and waited well over a month for any paperwork from them. My broker advised that I needed to ensure 2.5 payments be available in my account 'just in case'. These payments he advised were only ballpark amounts as SGI hadn't processed my policy yet. 2 months after supposedly being insured by them, I finally received my policy in the mail - 2 different versions and premiums that were mailed out by them on the same day. In the 3rd month, they withdrew 3 payments and my rate increased for the 2nd time in 3 months. I called to cancel my policy today and will monitor my bank account for theft of future premiums. My ex-wife and I jointly owned a 2003 Ford F250 4x4 diesel with about 167,000km that got stolen from outside the mechanic's shop at the end of July 2017. It was recovered August 2. The damage consisted of a punched-in key hole on the passenger side door, and the cover/lock on the ignition had been removed. We were a bit surprised when SGI almost immediately told us it was being written off. We figured the truck was worth at least $12,000, maybe up to $15,000 with the recent engine rebuild. Our SGI adjuster, Chelsea Leonew, gave us an initial offer of $6355 on August 10. We told her that was unacceptable and it was worth twice that amount. We submitted the recent bill for an engine rebuild (about $5800), but that only increased SGI's offer to $7660. We submitted ads for similar trucks from Kijiji for SK, AB, and MB, but SGI didn't budge. We hired an independent appraiser and went to arbitration. That cost us about $350, but we ended up settling for $11,500, which we thought was fair. Why did we have to spend $350 and a month in negotiation to arrive at a fair settlement? I had used the VMR Canada online calculator early in the process to see if we were off-base in thinking it was worth at least $12,000. The VMR Canada result confirmed we were being reasonable. However, I noticed that if you failed to check off the "HD Diesel V8" box, the value was pretty close to what SGI initially offered. I've got a gut feeling that someone at SGI made a keying error on the initial valuation. I've got no issue with someone making a mistake. It happens all the time. However, I've got plenty of issue with someone failing to recognize a mistake or trying to cover it up. We ended up with a final settlement that was 81% higher than the initial offer. Something was definitely wrong with the initial offers from SGI, beyond the expected low-ball. Why didn't someone at SGI go back and take a look at their calculations instead of wasting time and money going to arbitration? Something really stinks at SGI when it comes to write-offs. I still don't think the vehicle should have been written off in the first place. As well, when the final settlement after arbitration is 81% higher than SGI's initial offer, and 50% higher than SGI's final offer, shouldn't SGI have to reimburse the cost of arbitration? It was pretty clear that one side wasn't coming to the table with clean hands. Poor service and rip off! If I could put a no star, I would! Not even worthy of a single star. We had to pay for a Certified Extract License and we even told them we need it that day for a passport, we waited till 4 pm. They told us they will email it to us but we haven't received a single email from them the whole day. We had to pay the rush fee for the passport. I phoned them the off day to ask if they could just lessen the amount we paid on our registration or refund us 'coz it's really unfair for us that we had to pay a service that we didn't even get. They just told me they will just send it again. What for? We don't even need it anymore! We had to pay $110 for a rush fee already, you should change your policy for refunds! You're just ripping off people. Very poor and useless services as well! Received zero communication through SGI for the duration of our policy. Our premium was high for no reason ($200 per month for 2 females >30 w/ no claims). We were provided with a payment schedule for our policy, showing the last date a payment would be taken. We never received a renewal notice, however, they continued taking monthly payments after the 'final' payment, yet before our policy had expired. This company comes off as a bunch of crooks. Glad we never had to make a claim. Avoid. My auto adjuster was good in giving me necessary documents I needed for my car (tires were stolen and sgi was able to cover some of it after my deductible). However, she was reluctant to answer any questions I had. I do not have a lot of knowledge on these things or what SGI helps with and if each dealership differs. My boyfriend came into an SGI centre in asking about the papers and quote SGI gave me concerning replacing my stolen tires (I was out of province). They told him either way he will need me to give him official authnrorization to deal with this so they themselves said I need to call my adjuster (Debbie) in regards to it. So I did, and she was short tempered with me saying she has nothing to do with this, just send the bill (even though I was TOLD to call her) and wondered why I was asking her a question she cannot answer. She also claimed my boyfriend went into this SGI location with his own quote for the tires, when in reality he went in with the documents and quote she herself had provided to me. I think this customer service is poor for this reason. I really wish for SGI to hire better adjusters with good service skills and patience. Barry Chalifoux says he's lucky to be alive after what seemed like a slight car malfunction turned into a terrifying ordeal. On July 10, Chalifoux started on his regular weekly work commute from Loon Lake, Sask., to English River First Nation — a journey roughly 305 kilometres to the northeast — when he noticed that something was off around Beauval, Sask., close to halfway through his trip. "I was getting closer to Beauval when I saw smoke coming in. I saw smoke from the hood and also I could smell it coming into the vehicle," he said. 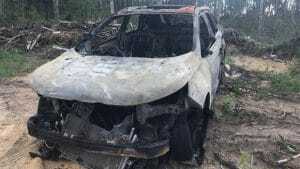 Seconds later, the front of his 2015 Ford Edge — a car that he had owned for less than a year — was engulfed in flames leaving him unable to use his power brakes because the electrical components had stopped working. No electrical meant his doors and windows were also inoperable. "I pulled into the side of the road to try to slow myself down and when the vehicle came to a stop, I tried getting out of the vehicle but [that] wasn't working either." I have nothing than good things to say about SGI, right after we hit a deer I immediately called and they were very helpful getting me a rental car as fast as they could since I was a long way from home. I had to go see a chiropractic for some minor injuries - so helpful with the steps I needed to take. It took a total of 2 weeks to find out and sign all the paper work needed to get the insurance $ for my car. I am now on the hunt for a new car. Thanks SGI for such great service. Saskatchewan Government Insurance (SGI) has upped auto insurance rates for light vehicles effective May 21. The rates have been increased to match the Canadian Loss Experience Automobile Rating (CLEAR) damage rate group table. SGI's 2017 rate changes The CLEAR table, which uses insurance claims data, helps insurers assess how likely it is that a specific vehicle will be involved in a claim and what that claim will likely cost. This includes claims caused by collisions, weather events, theft and other circumstances. Tried to register a private vehicle purchased at auction, brought paid receipt in, the staff at SGI Swift Current never even looked at the invoice as the teller asked 3 questions that were directly stated on the invoice (1 is it paid for? How did you pay? Where is it?) then promptly told me that they can't help me and to bring the original invoice ( which I had brought in). They didn't look at the invoice, told me it needed a signature of the owner (me or the bank that repossessed it? No clarification). They just had no intention of doing work, the phone/fax number of the auction company was clearly written on the invoice if they needed confirmation. What a joke this company is, the staff has no clue, the managers less and they couldn't train a dog to sit. If my tax money went to that Nigerian prince who keeps emailing instead of SGI pensions, it would probably get more for your dollar, with just as much satisfaction. Tell me again how my heart should bleed over your unpaid ten days off. I was recently in Sept, 2016, struck by an elderly 80+ year old driver at Reginas Cornwall Center. Opposing driver failed to yield to a designated turning arrow into the mall parkade. Since both vehicles appeared to be driveable by the looks of things, the police refrained from attending the scene. Shortly after driving my vehicle, I realize that the entire steering system and allignment was ruined due to opposing driver who hit my rear back tire. In a nutshell, I took a picture of the scene which I submitted to SGI. In the words of SGI, since both our statements varied and there were no independent witnesses, full fault could not be determined. Even if my evidence was fairly compelling, it was not without a doubt (how could it be?). Despite SGI knowing that one party is fully innocent, they imposed fault both ways, meaning I will be held responsible 50% for the collision in which I fully complied with the traffic laws. My 14-year old driving record is in jeopordey due to SGI's deplorable fault policy. This is a cash grabbing scheme by SGI, which is also a government body and a business at the same time. SGI runs the entire driving industry here, from licensing to insurance- they cannot be avoided. Being found 50% at fault because SGI was unable to determine fault without a doubt to either party, will cost me points and tarnish my record. It also means I will be forced to pay one month of car rental and half the deductible of $700. Saskatchewan needs better choices then SGI which is tantamount to a government mafia which needs to be dismantled in the name of privatization. As a crown corporation, they try to sell the idea they profited 45 million last year yet they did this on the backs and wallets of Saskatchewan residents, such as myself. All I can say is that if you can avoid SGI it will be in your strongest benefit to do so, if you can't, continue to advocate and lobby your political representation for change which would permit private insurers to do business in Saskatchewan, allowing Sask residents to freedom of choice in whom they chose to do insurance business with. Rude, compassionless, and unprofessional employees! Worst customer service I have ever experienced! I would think they would help victims?! We need something different in Saskatchewan! My daughter was hit by a drunk driving a truck. Her body landed 12 feet from the spot where he hit her. This was his 3rd DUI. He probably stayed in jail for about 4 months. She has a permanent brain injury which leaves her fatigued, etc. She has chronic pain from her injuries. She is unable to work. SGI was terrible to deal with. Did not want to help her and more or less told her to learn how to deal with her new reality of life. I think most people think that when something this terrible happens to you that you will be looked after through insurance. We found out this is not so. We need to get rid of SGI. SGI has disposed of my van and the claim has not been settled. Note it is still within the two year time period to settle. I had personal items in the van and SGI has been hardballing me on the price. They sent me a web site evaluation for $4550 and then promptly told me that it was only worth around $2200. They are now up to $3300 less the $700 deductible. They are not making any comment on my personal items. Now I am presented with the cost of a professional arbitrator which I have no idea where or what that will cost or if it would be worthwhile. I asked SGI for what they got for the van when it was disposed and they remain quiet. I was in a wreck were my truck accelerated uncuntrolably I intentionally hit the ditch to miss a oncoming truck the rcmp found no fault and I wasn't charged. Skip to may 30 I go in to get my truck estimate and to see my adjuster and I have a recording of her saying yes the 2005 colorado did have a recall point for a throttle problem but since its an older truck it shouldnt have happened so i handed in some print outs of similar events where the truck accelerated uncuntrolably. June 16 I find out I am 100% accountable for the wreck. June 23 I asked for a higher up they called me and stated that there was no recall on 2005 l5 colorado throttle control only the v8...... no v8s in 05. RE SGI is evil, My advice to you is get on your computer and start finding comparable sales for your vehicle. I would also tell SGI you want to save your vehicle and you are not accepting their lame offer to write off your vehicle. (Oh sure you can buy it back and go thru inspections to re insure your vehicle but keep in mind this action could be a potential nightmare). Inform SGI you want to go to arbitration then hire an arbitrator! You will have to fill out a form in regards to what you think your vehicle is worth, your arbitrator should help you with this. Google vehicle appraisers or look in the yellow pages under auto appraisers/arbitrators. I went down this road last fall it was the best $250.00 I have ever spent. After winning my case my SGI adjuster calls me and acts like my best friend telling me how great it is that my vehicle is being fixed etc. Please! Hire an arbitrator!